Levico’s waters, unique in Italy, rare in Europe thanks to the mineral properties effective in reducing anxiety and stress. The water of Levico and Vetriolo was discovered in the middle-ages during the digging of the iron and cupper mining tunnel in Vetriolo, a mountain village nearby Levico Terme. Two rivers flow; the first one is the one of “ strong water” that even today flows inside a narrow and old mineral gallery at 1582 meters above sea level and at a temperature of 9 degrees Celsius. At the moment it is the only water used to cure in our spa. The second spring is the one of the “light water”, it has similar physical and chemicals characteristics, but less stable and for this reason not yet used for treatments (tests we are doing will allow us to do so in the future). 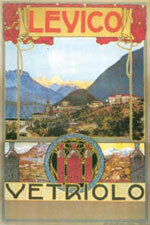 The first uses of Vetriolo’s thermal water were in the area, where hotels were built with indoor water to cure and swim. But only since 1860, thanks to the construction of an aqueduct, that carried the mineral water from Vetriolo to Levico realized by the company “Società Balneare” that had obtained the right of exploitation of the thermal water, that the development of the thermal spa town began. It became soon known throughout Europe and was assiduously attended by eminent personalities of the time and members of the House of Habsburg. The company “Società Balneare” built the great establishment of the baths which was enlarged and completed around 1886/7. 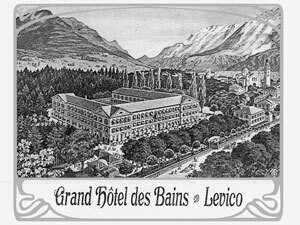 At that time Levico was already a highly developed thermal centre, known in Europe, and its numerous hotels were mostly concentrated in the west part of the town, where the spa centre was. A significant boost of the spa town of Levico was impressed by the Berlin entrepreneur Giulio Adriano Pollacsek in the late nineteenth century. He planned the building of the Grand Hotel Imperial and of the large surrounding park both located in east Levico, thanks to the contemporary building of the Valsugana Railway by the Austrian Government. The hotel spa and the park were opened in 1900. Archduke Eugen of Austria attended the opening of the Grand Hotel and Spa with several high-ranking guests from all over Europe. The events related to the two world wars involved heavily Levico and its spa area. World War I, which saw the war front not far from Levico, but mainly the second world war, caused severe damages to the original hotel structures and to the bathing facilities. In Levico, near the end of World War II (September 1943-April 1945), there were the headquarters of the Wehrmacht for the north-east zone and the headquarters of the German Navy for the Adriatic area. Hence the repeated bombing by the Allies and the complete destruction of the Grand Hotel Regina. At the end of the war, the spas and the springs became first property of the Regione Trentino Alto Adige and then, since 1973, property of the Provincia Autonoma of Trento. The Provincia managed the spas, the grand hotel, and the bottling factory of the natural water (not thermal) until January 1996, the year in which the management of the entire compendium was entrusted to private ( Levicofin srl). . The large new spa centre located in Viale Vittorio Emanuele was built in the 60s of the twentieth century. In recent years and until 2009, the Provincia of Trento owner of the spa centres of Levico and Vetriolo began the restructuring that is now almost complete, so that both Vetriolo’s spa centre and the imposing one of Viale Vittorio Emanuele can be considered among the most modern Italian Spas.